Sapa is famous for both its fine, rugged scenery and also its rich cultural diversity. If trekking is your thing, why not opt for a two or three day experience incorporating homestays in the villages of your choice. What better way to expose yourself to the cultures and colour of Vietnam's ethnic minorities on a trek through terraced rice paddies, bamboo groves and traditional villages all in the shadow of Mount Fansipan. There are two types of homestay. The choice is either a well established mini guest house style homestay with other travellers or staying in an a traditional Hmong home as exclusive guests. In both, expect to experience village life in all its glory. On the plus side, you will get some quality time with the wonderful Black Hmong community. 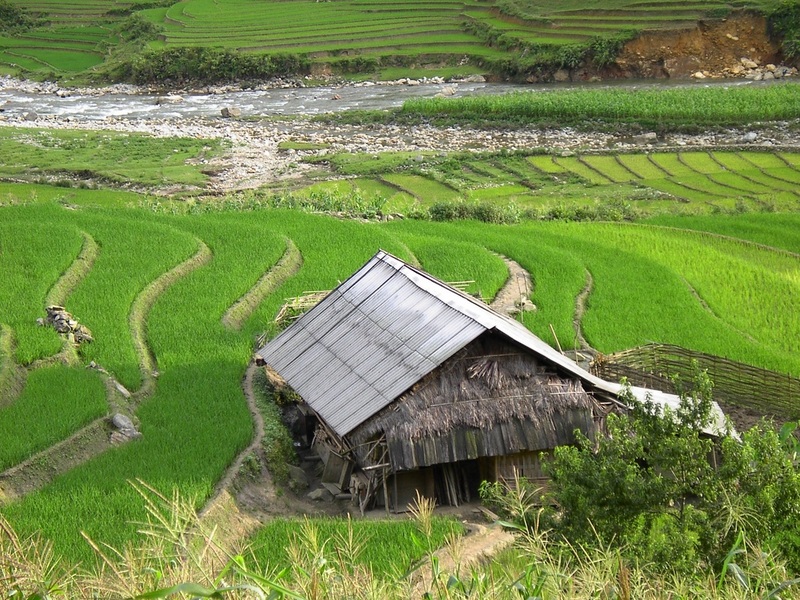 Hmong homes are set within the famed rice paddies and have incredible views if the weather permits. On the downside, expect to be awoken early by roosters or the families livestock. You can choose towards the end of your trek which type of homestay you want to stay. Your choice of trek often influences the homestay we can use. The guesthouse style homestays are quite large and built from wood or brick. There are no separate bedrooms or en suit bathrooms and only some homestays have wifi. The guesthouses do have electricity. Typically, there is one big open space upstairs, which is then divided into zones with mosquito nets. The photos below show the sort of setup you might expect. These homestays normally have a couple of western style toilets and warm showers. The number of guests varies per day, but typically, two to three groups will share a particular homestay on any given night. There are facilities to buy soft drinks, beers or water at an additional cost. The bathrooms are clean and do offer privacy. There are hot showers and flushing toilets! Whilst walking around the house, it is best to take off your boots and slide into a pair of the plastic sandals. For more tips of acceptable behaviour, please see our comprehensive code of conduct. If you are looking for absolute authenticity in a real home, then this is the choice for you. You can cook and eat with your host family and generally enjoy the hospitality of Sapa's mountain people. The only way to guarantee a private experience is to stay in a traditional home. These homes also come equipped with a sleeping area and mosquito net, but bathroom and toilet facilities vary. Many homes have no toilets whatsoever, whilst others have long drop latrines. The traditional way of cooking is over open flame. At dinner time, with all the cooking that goes on, the house may get quite smoky. Mosquitos can be an issue in summer, but they are not terrible (just bring repellent and use the mosquito net provided). Long trousers are recommended for after sunset. Roosters will cockle-doodle-doo very early in the morning, but it’s just the signal that you might want to get up and see what’s going on in the village! Yes, the hill tribe culture could be described as welcoming but shy. Do your best to humbly initiate things like helping with the cooking, working in the fields, and playing with the local children, or dressing up in the local costumes. The more you participate the richer the experience. Just remember to ask politely. Finally, there is cultural etiquette that should be followed. Notably, do not wear all white into the villages, and do not touch people’s heads. Also, do not take pictures, especially close-ups of the infants in the village – even if locals say it is okay, it’s really not. For others, just ask your guide, or ask your local homestay owner. Learning about the culture is an important part of these types of experiences. To see our full code of conduct, please click here.